Restorative electrolysis is my major specialty and is required when you have waxed, plucked, tweezed, shaved and have had temporary laser hair removal that has damaged the appearance of the skin. Temporary hair removal results in your skin being prematurely aged, discolored, rough and dried out with acute case of folliculitis. These conditions can be improved or cured with specialized practical application, antibiotic therapy and removal of dead tissue along with my common sense economical recommended skin care regimen. Fact women and men often have acute folliculitis (distorted ingrown hairs) from temporary laser removal, waxing, plucking, and shaving and substandard electrolysis treatments. Fact, if your start a prescribed antibiotic therapy just before or shortly after treatment your healing time can be enhanced plus your complexion can be greatly improved. In addition to that antibiotic therapy expels foreign bodies (distorted ingrown hairs) that have been trapped in your skin for six months to a year. These dead microorganisms discolor your complexion by inflaming the follicles and surrounding tissue. In my professional opinion this condition results in your area being discolored with a reddish brown mottled appearance and add to the fact that you still have heavy facial hair it makes it impossible for you to have a smooth healthy feminine complexion. Women and men who have had moderate to intensive temporary laser hair removal and sub-standard electrolysis are vulnerable to these inflammations such as pustules, cellulitis, folliculitis and erythema. Nevertheless a prophylactic antibiotic therapy started before your treatment induces fast healing by expelling dead micro-organisms of the skin such congealed blood, fragments of sebaceous and suderiferous glands. The intense heat from temporary laser hair removal has been known to cause and to congeal blood, damaged or destroy sebaceous and suderiferous glands plus it leaves these dead microorganisms of your skin trapped under the skin with the ingrown hairs. YOU ASK WHY DO I NEED ANTIBIOTIC THERAPY? For women my goal is not only to remove your unwanted hair problem it is also to help you attain a beautiful feminine hair free complexion and if your skin has not been permanently damaged by temporary methods such as laser, waxing, light treatments and excessive plucking that goal can be achieved. Quite often many of my patients have noted that with their improved skin plastic surgery and dermabrasion are not needed. However if your skin has not been damaged there are ways to improve your skin with out surgery because I have an inexpensive skin care regimen for my patients who have electrolysis intensives and these are a few of the reason of why an in house consultation and evaluation is requisite before your treatment. 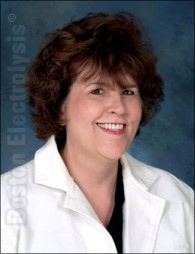 Presently I am one of the few licensed and registered electrologists in United States who specialize in the treatment of "Electrolysis Intensives" from minor to severe. If your unwanted hair problem has been exacerbated by a laser parlor operator, substandard electrolysis-electrology, waxing and other temporary methods you most likely need restorative electrolysis. These temporary methods damage your skin and often cause acute follicultis and unattractive skin conditions that keep you from looking your best. Quite a few patients skin conditions require a five-month course of antibiotic therapy because of acute follicultis, inflamed infected ingrown hairs that cause a major portion of the face and neck to have an inflamed reddish brown discoloration that no makeup can hide. Laser hair removal permanently damages your skin by burning its minute structures and micro-organisms at, near or below the surface of the skin such as sebaceous and suderiferous glands, arrector muscles, sensory nerve and collagen fibers are totally are partially destroyed. These trapped and partially destroyed micro-organisms that are embedded in your skin are dead and decaying minute structures that discolor it down to coruim level and even further in acute follicultis. These dead decaying structures discolor the skin must be removed and the only way they can be expelled is gentle manual removal with a three to six month course of prophylactic antibiotic therapy for soft tissue inflammation and infection of the skin. Without one doubt the use antibiotics for soft tissue inflammation and infections are used. Once the antibiotics are started you will see a notable and steady improvement of the skin as it starts to heal it brings dead ingrown hairs close to the surface for easy removal. Dead and decaying tissue and hairs that have been in trapped in the skin for years will be expelled and a healthy pink skin gradually returns. Simultaneously epsom salt soaks are required twice a day every day until instructed not to. Antibiotic therapy heals the skin and its inflamed infected ingrown hairs while simultaneously eliminating sensitivity to treatment. From to six months there is major improvement in your skin where you do not need antibiotic therapy. Restorative electrolysis is standard operating procedure at Boston School of Electrolysis™ when your unwanted hair problem has developed into acute folliculitis is from moderate to severe must be evaluated and plan for the recovery of you complexion is put in motion. Restorative electrolysis is the only known cure for this particular hair and skin conditions that require expert practically applied electrolysis treatments coordinated with your physician for your antibiotic therapy. Fact and for the record for you to achieve the best results you have to realize that it takes time to undo the damage caused by temporary hair removal such laser, waxing plucking, tweezing and shaving. To add insult to injury it takes more time to get over those broken promises made to you by laser parlor operators and other quacks. However when you ready, willing and able to improve you're complexion, appearance and emotional well being give me a call. Fact and for the record you will be professionally evaluated and there will be no exaggerated promises at my office you will honest appraisal of will take to restore or improve your complexion to the best possible condition.